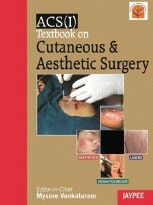 "ACS(I) Textbook on Cutaneous and Aesthetic Surgery" is a comprehensive textbook providing in depth knowledge about all things related to becoming a successful dermatosurgeon. It has been conveniently divided into six sections and over 60 chapters dealing with everything starting from the basics upto the advanced dermatosurgical techniques such as liposuction, blepharoplasty and lasers. Considering the significant importance of vitiligo in Indian skins, part of a section has been dedicated to the surgical management of vitiligo, which spans from the earliest and oldest available techniques to the most advanced ones like cultured melanocyte transplantation. The rich experience of the diverse set of authors shines through in the array of chapters providing details of all the common procedures that a dermatosurgeon would wish to know about. Authors include eminent dermatologists and dermatosurgeons from India and also, plastic surgeons and even oculoplastic surgeons for relevant topics. The book begins with a section on principles of dermatosurgery including relevant anatomy, setting up an operating theatre, instruments, anaesthesia, emergencies and antibiotic use. This is followed by a section on standard dermatosurgical techniques, including excisions, electrosurgery and cold steel surgery. Special procedures, including vitiligo surgery, nail surgery, acne scar management and sclerotherapy form bulk of the next section. Cosmetic dermatologists would find a variety of useful informations from the first-hand experience of the authors who have authored the section on peels, hair transplantation, liposuction and other cosmetic procedures. Lasers, too are dealt with in a lot of detail with special emphasis on their use in darker skin. The book concludes with a useful section on certain miscellaneous topics and 'last is definitely not the least' since tips and tricks and knowledge about medicolegal issues and accreditation are essential to the successful set-up of a dermatosurgery unit. With almost 1000 color images and illustrations, this comprehensive treatise is the all-in-one book for anyone who wishes to excel in dermatosurgery. With a multi-authored book, the complex issue of uniformity in language and presentation has been taken care. Perhaps the basic principle was to keep things simple and lucid. The editor-in-chief Mysore Venkatram and his large team have accomplished a daunting task in bringing out this book. Furthermore, it is important to underscore that though this book has Indian perspective and all the photographs are of Indian patients, the details are generally relevant to international readership as well and that too on a Indian price of just 3900 rupees!